In this last and final chapter of pair trading, we will take up an example of a live trade and discuss factors that influence the trade. Over the last few chapters, we have discussed each point in great details. These points help us understand which pairs are worth considering for pair trading. In a nutshell, we take any two stocks (from the same sector), run a linear regression on it, check the error ratio and identify which stock is X and which is Y. We now run an ADF test on the residual of the pair. A pair is considered worth tracking (and trading) only if the ADF is 0.05 or lower. If the pair qualifies this, we then track the residuals on a daily basis and try to spot trading opportunities. Having said so, I generally prefer to initiate the trade when the residuals hit 2.5 SD or thereabouts. Once the trade is initiated, the stop loss is -3 SD for long trades and +3SD for short trades and the target is -1 SD and +1 SD for long and short trades respectively. This also means, once you initiate a pair trade, you will have to track the residual value to know where it lies and plan your trades. Of course, we will discuss more on this later in this chapter. Downloads the last 200-day closing prices of the underlying. You can do this from NSE’s bhavcopy, in fact, automate the same by running a script. The adf test is applied on the residuals, for the combination which has the lowest error ratio. A report (pair data) is generated with all the viable X-Y combination and its respective intercepts, beta, adf value, standard error, and sigma are noted. I know we have not discussed sigma yet, I will shortly. If you are a programmer, I would suggest you use this as a guideline to develop your own pair trading algo. Look at the highlighted data. The Y stock is Bajaj Auto and X stock is TVS. Now because this combination is present in the report, it implies – Bajaj as Y and TVS as X has a lower standard error ratio, which further implies that Bajaj as X and TVS as Y is not a viable pair owing to higher error ratio, hence you will not find this combination (Bajaj as X and TVS as Y) in this report. I’m assuming (and hopeful) you are aware of the first three variables i.e intercept, Beta, and ADF value so I won’t get into explaining this all over again. I’d like to quickly talk about the last two variables. Standard Error (or Std_err) as mentioned in the report is essentially a ratio of Today’s residual over the standard error of the residual. Please note, this can get a little confusing here because there are two standard error’s we are talking about. The 2nd standard error is the standard error of the residual, which is reported in the regression output. Let me explain this with an example. This is the regression output summary of Yes Bank versus South Indian Bank. I’ve highlighted standard error (22.776). This is the standard error of the residuals. Do recollect, we have discussed this earlier in this module. The second highlight is 20.914, which is the residual. This number gives me information of how today’s residual is position in the context of the standard distribution. This is the number which is the key trigger for the trade. A long position is hit if this number is -2.5 or higher with -3.0 as stop loss. A short position is initiated if this number reads +2.5 or higher with a stop loss at +3.0. In case of long, target is at -1 or lower and in case of short, the target is +1 or lower. This also means, the std_err number has to be calculated on a daily basis and tracked to identify trading opportunities. More on this in a bit. The sigma value in the pair data report is simply the standard error of the residual, which in the above case is 22.776. So now if you read through the pair data sheet, you should be able to understand the details completely. I have been running the pair trading algo to look for opportunities, and I found one on 10th May 2018. Here is the snapshot of the pair data, you can download the same towards the end of this chapter. Do recollect, this pair trading algo was generated using the closing prices of 10th May. Look at the data highlighted in red. This is Tata Motors Ltd as Y (dependent) and Tata Motors DVR as X (independent). The ADF value reads, 0.0179 (less than the threshold of 0.05), and I think this is an excellent adf value. Do recollect, ADF value of less than 0.05 indicates that the residual is stationary, which is exactly what we are looking for. The std_err reads -2.54, which means the residuals is close has diverged (sufficiently enough) away from the mean and therefore one can look at setting up a long trade. Since this is a long trade, one is required to buy the dependent stock (Tata Motors) and short the independent stock (Tata Motors DVR). This trade was supposed to be taken on 11th May Morning (Friday), but for some reason, I was unable to place the trade. 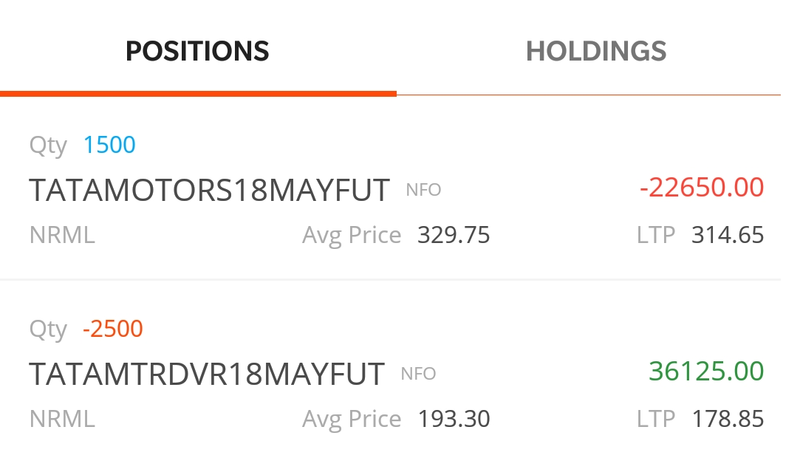 However, I did take the trade on 14th May (Monday) morning at a slightly bad rate, nevertheless, the intention was to showcase the trade and not really chase the P&L. Question – Did I actually execute the trade without checking for prices? As in I didn’t even look at what price the stocks, I didn’t look at support, resistance, RSI etc. Is it not required? Answer – No, none of that is required. The only thing that matters is where the residual is trading, which is exactly what I looked for. Question – On what basis did I choose to trade 1 lot each? Why can’t I trade 2 lots of TM and 3 lots of TMD? Answer – Well this depends on the beta of the stock. We will use the beta and identify the number of stocks of X &Y to ensure we are beta neutral in this position. The beta neutrality states that for every 1 stock of Y, we need to have beta*X stock of X. For example, in the Tata Motors (Y) and Tata Motors DVR (X) for example, the beta is 1.59. This means, for every 1 stock of Tata Motors (Y), I need to have 1.59 stocks of Tata Motors DVR (X). Going by this proportion, the lot size of Tata Motors (Y) is 1500, so we need 1500*1.59 or 2385 shares of Tata Motors DVR (X). The lot size is 2400, quite close to 2385, hence I decided to go with 1 lot each. But I’m aware this trade is slightly more skewed towards the long side since I’m buying additional 115. Also, please note, because of this constraint, we cannot really trade pairs if the beta is –ve, at least, not always. Remember, I initiated this trade when the residual value was -2.54. The idea was to keep the position open and wait for the target (-1 on residual) or stop loss (-3 on residual) was hit. Until then, it was just a waiting game. To track the position live, I’ve developed a basic excel tracker. Of course, if you are a programmer, you can do much better with these accessories, but given my limited abilities, I put up a basic position tracker in excel. Here is the snapshot, of course, you can download this sheet from the link posted below. As you can see, the current values were tracked and the latest z-score was calculated several times a day. The position was open for nearly 7 trading session and this is quite common with pair trading. I’ve experienced positions where they were open for nearly 22 -25 trading sessions. But here is the thing – as long as your math is right, you just have to wait for the target or SL to trigger. Notice, the gains in Tata Motors DVR is much larger than the loss in Tata Motors. In fact, when we take the trade, we will never know which of the two positions will make us the money. The idea, however, is that one of them will move in our favor and the other won’t (or may). It’s however, just not possible to identify which one will be the breadwinner. Alright guys, over the last 13 chapter, we have discussed everything I know about pair trading. I personally thing this is a very exciting way of trading rather than blind speculative trading. Although less risky, pair trade has its own share of risk and you need to be aware of the risk. One of the common ways to lose money is when the pair can continue to diverge after you initiate the position, leaving you with a deep loss. Further, the margin requirements are slightly higher since there are two contracts you are dealing with. This also means you need to have some buffer money in your account to accommodate daily M2M. There could be situations where you will need to take a position in the spot market as well. For example on 23rd May, there was a signal to go short on Allahabad Bank (Y) and long on Union Bank (X). The z-score was 2.64 and the beta for this pair is 0.437. Going by beta neutrality, for every 1 share of Allahabad Bank (Y), I need 0.437 shares of Union Bank (X). The Lot size of Allahabad Bank is 10,000, this implies I need to buy 4378 shares of Union Bank. However, the lot size of Union Bank is 4000, hence I had to buy 370 shares in the spot market. I know most of you would want the pair data sheet made available. We are working on making this sheet available to you on a daily basis so that you can track the pairs. Meanwhile, I would suggest you try and build this algo yourself. If you have concerns, please post it below and I will be happy to assist. What if Stock A with Stock B is not stationary, but instead Stock A is stationary with stock B & C as a combined entity? Beyond Pair, trading lies something called as multivariate regression. By no stretch of the imagination is this easy to understand, but let me tell you if you can graduate to this arena, the game is different. how do we position size the trade? Is it possible for us to know the amount we would lose if the trade goes wrong? You will have to go by beta neutrality to position size this trade. Have explained this in the chapter. It is hard to know how much you may lose in advance as the trade is on the z-score. I understood the beta neutrality part of position size. My question is, let me take an example from above. lets say 1 lot of tata motors is equal to 1 lot of tata motors DVR. In this case if I want to trade 2 lots of each of the script then how do I know if it is safe for me to position 2 lots assuming I have funds to take the position. That’s why I wanted to know if their is any way if we could know the amount of loss we would suffer in case the SL hits. Assuming I am willing to risk 5% of my account in one trade. If trading 1 lot of both has a SL at 2.5% then I can probably do 2 lots right? Is there any rough approximation of finding out the loss. I am not worried about winning because we are entering at 2SD level. And from the trade you mentioned above, you have entered the trade of tata and tata dvr on 14th and profit was taken on 23rd. Assume you have not got the profit signal and the trade is open, there was a quaterly result announcement on 24th, what do you recommend us to do? Should we close the trade or keep it open if there is any situation like this? I get your concern, Nikhil. Unfortunately, there is no way this can translate to a Rupee value. Or maybe I need to do some research, I will certainly get back to you on this. But here is what I have observed, whenever this position makes a loss (assuming its initiated at 2.5SD), it is usually in the range of 10-12K per beta neutral pair. This is purely from my observation and no concrete science backing this. What about the 2nd question on result announcement part? I have a doubt. Are the regression parameters “static” or “dynamic” in your basic excel tracker sheet? As we know these estimators (coefficients, std. error….) have variance. Everytime we regress the securities the values of the estimators get varied. So taking the parameters of the eqn. y=mx+c as constant and calculating Z-Score based on earlier calculated estimators might give some error, i guess. What is your view, sir? Thank you very much for this most awaited chapter, sir! You are right on that. Given this, you may also want to look at the variance or standard error of the intercept as well. However, these trades are open for few days, unless there is a drastic move in the share price, you will not experience big changes in the variables. When we run linear regression using python statsmodels library we don’t get STD error of residuals in the output. Is there any formula to calculate the STD error using residual values? You actually don’t need the standard error of residuals, you only need the residuals. The standard deviation of the residuals is the standard error of residuals. You can divide the residual by standard error of residual to get the Z-score. Sir what is use of Z-score.M not geeting. Z-Score tells you where the variable is with respect to its mean. For example, a Z-score of 2.5 indicates that the variable is 2.5 standard deviations away from the mean. Its best if you do it in futures because the strategy requires you to short stocks as well, which is possible only in futures. Hello sir.. was eagerly waiting for it. A big thanks. ? Thanks for educating us sir 🙂 . It would be of great help if you could share/made available the pair data with ‘P’ values on weekly basis. When i regressed TM(Y) & TMD(X) over one year data set(249 data), it didn’t show any trading opportunity on 11/05/18. 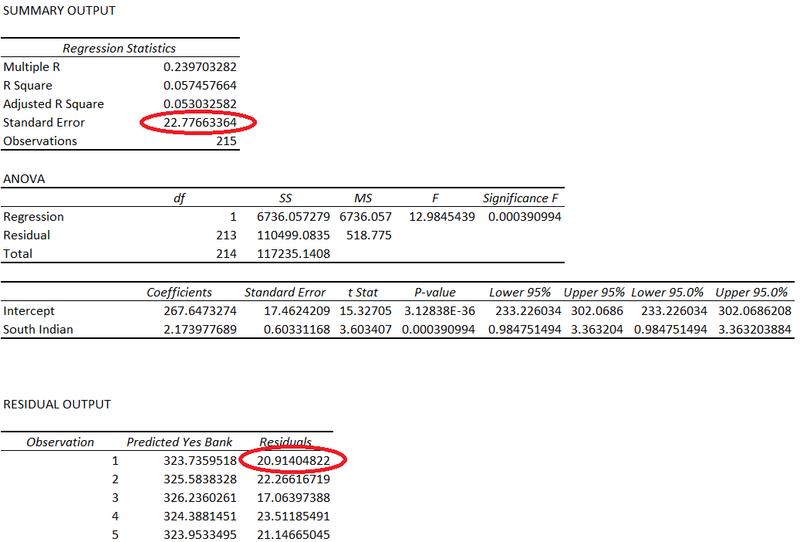 While comparing the two regression analysis i noticed that the regression done on 200 set of data generated better results than that of one year data analysis. Also the ADF value was lesser in the former(200 day data) regression. 1) Is 200 day data optimum for data analysis? Can we regress 100 set of data too? 2) The ADF value i got after regressing the same set of data as done here on Varsity is 0.0567 while your value is 0.017. I used both Schwarz Info criterion & Alkaike Info criterion with the lag length of 14 (it was automatic). Which criterion should i use and what should be the optimum leg length to run ADF test? I had asked this question almost 3 weeks ago and you told me to wait. 2) The lag is usually set to the square root of the number of data points…so a lag of 14 is good (sqr root of 200). Btw, I’m really not sure why there is a difference in ADF values. Had one question. If Lot size of X is , say 800, and Y is 1000. From Linear Reg. slope comes out to be very low, say 0.001. Then how do we calculate hedge ratio in this scenario? This would be tricky as the beta is near zero. YOu cannot really trade this pair. In your live trade example, the trade was open for almost 7 days. How is it that the institutional traders did not spot this opportunity to jump in and close the divergence more quickly? Am I missing something? Samir, as retail traders, we have the advantage of liquidity (or maybe illiquidity). Institutes want to trade few 100 of lots with low slippages… a couple of lots here and there won’t matter to them, but it would make a big difference to an individual. i am new at treading and not so familiar with ADF test but i have software known as E VIEWS which will test ADF. but i don’t know how to run with it. how to enter data in software if sum one know let me know. Sir, have you tried pair trading using 2 ATM options? Since historically option premiums data are not available I couldn’t test the effectiveness of it. No, have not really tried pair trading with options. There would be other dynamics when you trade options. Thanks for your lessons on pair trading. I want to know is it possible to do pair trade in commodities as well like GOLD:SILVER, COPPER:NICKEL, LEAD:ALLUMINIUM? There is one website, pairtradepro. Com which is giving pair trade signals. Can you anything sure about that??? I’ve never really tried it, Ashwin. Hence cant comment on it. am I missing something here sir? Look back period is 200 days. but I am gettings same backtest value for ICICI HDFC price data that was provided in the earlier chapters sir, is it possible for you to share closing price data for TATAMOTORS–TATAMTRDVR, I think that would help me a lot. Mani, go back 200 trading days from 10th May, that would be my closing price data. Also, this data was obtained from NSE bhav copy. What lag did you select for the ADF test, Mani? I think the algo we use has a lag of 14. Value that I got from my algo is same as excel output, so I guess I can continue. Is my conclusion good enough sir? Hmm, maybe Mani. Request you to check this across multiples examples to be doubly sure. The trading signal was generated on 22nd May to go long on ALBK and short on Unionbank. Oh my God! It is just opposite of what you traded. I have cross checked my regression analysis. Please help me, sir. Kumar, you are right. I’m guilty of this trade information that I put up. It misread this as 2.64 instead of -2.64, but I think I lucked out because the Z-score expanded over the next few days and I actually was in profit when I realized my mistake. Sir here kumar used price data from 2nd of Aug’17 to 22nd May’18, if so doesn’t it workout to be more than 200 days? I think I am missing something sir? I guess its ard 200, need to check the data points, Mani. I get it sir, trading days. I made a mistake in my code that calculates number of trading days sir. So was using less data points. Glad you could rectify it. While updating the pair data sheet, luckily i got the following trading signal on 4th June’18. If i take 8000 Baroda then according to the eqn the lot size of Indianbank should be 2176. What is you view, sir? Did you take the trade? If not, at least track it on paper and please share the results here. I’m not tracking this. I have a question, sir. When i checked the 100 trading day data for the same pair, the ADF value was 0.5135 and Zscore was -3.58. Is it convincing that we should check this way or should stick with 200 data set? Thanks for constantly sharing your insights on the pairs. I check the z-score and getting -2.09 for 200 days. Not sure where the error is ? Can we connect on at deepucal at gmail dot com. I have taken 2 lots (8000) of Baroda and 1 lot (2000) of Indianbank. But for 8000 of Baroda the lot size of Indianbank should be 2176 or for 2000 of Indian bank the Baroda should be 7352. Sure, as long as you ensure its beta neutral. While optimizing lookback, is net profit only criteria or any other factors need to be considered sir? can adf p_value be used for any timeseries data to confirm its normal distribution property sir, does it have any limitations? Yes, it can be applied on any series on which you want to check the stationarity. if a time series data passes stationarity test, does it mean that it is normally distributed? I’m not very sure about this, but yes, I’m inclined to believe this is true. Ohh beta “neutrality”, been wrecking my brains to understand what beta natality could be, theek kar do sir. Also, pair trading ki updated sheet de do? Beta is a measure of volatility between two stocks, so when you beta neutral two stocks, you are essentially trying to minimize the volatility between them. I meant its been misspelled so I was trying to figure out what beta natality could be…also where can we find the bi-weekly update to the pairs data? I’ll have the sheet updated t’row. Thanks. Sir wt is use of sigma. Sigma is the standard deviation of residual, which we get while we hedge Y in terms of X.
Sigma tells you the standard deviation of the residual. Great chapter, really enjoyed it. Also are you going to be giving the pair data sheet? Will try and upload the sheet today. That would be difficult, Manoj. I’m trying to set up a daily source of pair data to be made available on the site. This may take some time. Ok, understood. In that case could you please run the adf test (using your plugin) against the ‘Chapter-10_Residuals.xlsx’ excel file from chapter 10 and provide the intercept, beta, adf_test_P.val etc. So that I can check the values generated at my side against the values generated using your plugin. I need to verify this only once to make sure that the logic at my side is correct. Sure, Manoj. I will try and do that over the weekend. I am confused as to, for tracking position after executing the trade, we will have to calculate the std_err by using the current price based sigma , beta and intercept (by doing regression by replacing the old with new data for past 200 look back period) or the initial values which we used to execute the trade? Because, the beta, sigma and the intercept values will change the next day if we add the recent data in the 200 look back period and so will the std_err. 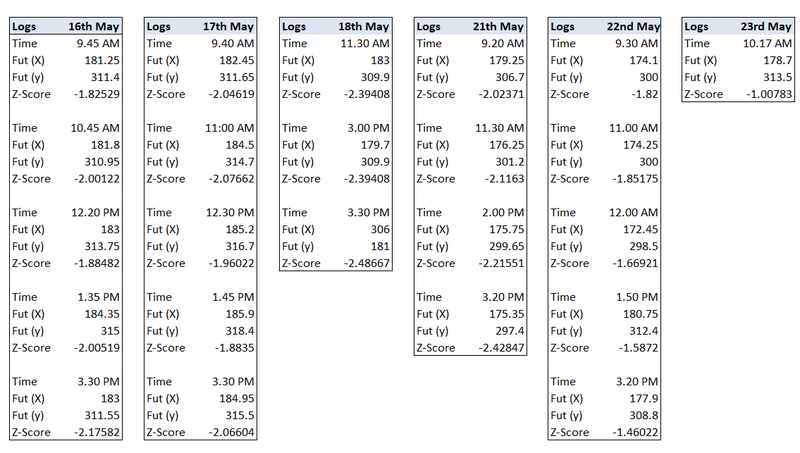 In the position tracker excel which you provided the beta, intercept and sigma are kept same for 14th and 23rd of May. Please, help me clear this doubt. Once the position is taken, the new data set will exclude the oldest data and include the latest data point. 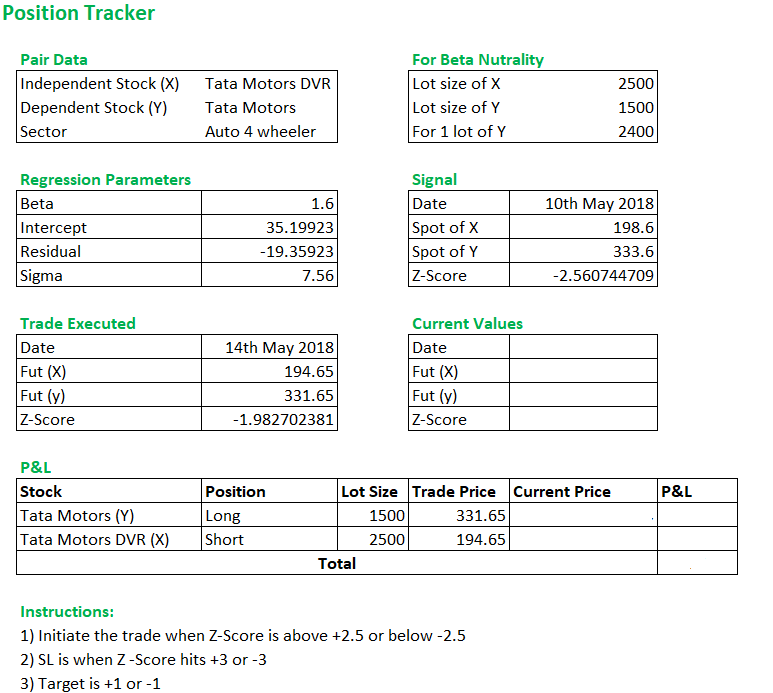 The position tracker considers the pair data at the time of trade trigger. Thank you so much for very easy understanding language in explanation. I went through all the content here on varsity, also i went through a course for stock trading with one institute. Anyways my little confusion is when i was in Options chapter i did paper trading and made few conclusion on my trading way. Now after this chapter im in a small dilemma whether to trade options or the pair trading. First i use to trade equity, after learning options i felt equity day trading is more on luck than rational trading. Pair trading and the calculation are more rational now. Please help me understanding which is more right way to trade and more rational between options and pair trading. Happy i found Varsity,thank you sir. Kiran, both are very different because the instruments and their risk-reward profile is very different. I’d suggest you pick up both techniques and eventually decide which one suits you better. Good luck. `Dear All I wish to know in 8k option strategy how do choose?? I’d suggest you download the eq data, Vikas. We have not updated this, Karthik. Hello Sir, thank you for strategy. Can i do this in equity than futures? the only reason being capital. You cannot really short in Equity, so you cant. Thank you for the wonderful explanation. In some cases, I have observed that the std. error went down to -4 as a result of certain events, case in point being YESBANK from Sept 21 to 28, was a drastic drop. Do you recommend going long when I see the error being much lower or higher than -2.5/2.5 trigger or do you think i should avoid it due to volatility. ( the error has gone back to around -2 now so if i took the trade I would have profit). On the other hand, If i took the trade at -2.5 I would have lost money going down to -4. Any idea if there is any other parameter to look at to avoid this? These are fundamentally driven events, Sudharsan. The best case for pair trading is when all else are equal. Given this, I’d not initiate a trade even if I saw a 4SD in the backdrop on fundamental events. Thanks for this wonderful module, got to learn another very useful trading system. Towards the end of this chapter, you mentioned something about multivariate regression, I really wanted to know more about this. I have good or decent enough background in linear algebra, regression analysis, and programming, hence, I really want to dig deeper into this subject. Could you please provide some pointers to get me started on this? Thanks for all your help! Unfortunately, there is not much content on Multivariate and I’m really not sure if we should put up anything, it could be a little hard for the readers here. Does the statement mean that we have two independent variables and one dependent variable and if we regress stock A(dependent) against stock B and stock C combined we can generate one column of residuals and hence by that we can check for cointegration by the equation Y=mX + nZ + constant…where Y is stock A ,X is B and Z is C, m and n are betas for B and C and the constant may be considered as equivalent to intercept??? Exactly! This is how multivariate regression for trading stock pairs works. Can you help me with link on NSE site that gives sectorial categorization of stocks and their EOD data ? I need to look for this myself, Ravi. Will share the link if I find. First of all loved the way you explained this complex subject. I’m bit confused while selecting the lot sizes of X and Y. If Y= m*X (m is slope/beta) then for 1 lot of X is equivalent to m lots of Y (substitute X=1 in equation Y=mX ). But you have taken other way round. Am I missing something when you say ” beta neutral ” ? Not sure if I’m missing your point. “The beta neutrality states that for every 1 stock of Y, we need to have beta*X stock of X”. This is applicable to equation X=mY by substituting Y=1lot, you get X=m lots. As per my understanding, its not Y=mX equation. Please correct me if I’m wrong. Thanks. Govil, let me go through this again. how to convert MIS to CNC before squareoff.? 1: Given that X and Y are stock prices – shouldnt the beta neutrality be applied on nominal exposure so if tata motor (Y) – Tata Motor DVR (X) has a BETA of 1.59 shouldnt it mean that exposure on tata motor should be equal to 1.59 times the exposure on Tata Motor DVR? so if nominal value of one lot of tata motor is (1500*331.65) Rs 497,475 the exposure i need to take in DVR is 1.59*497,475 = 790,985 which translates into 4064 shares of DVR @ 194.65. please clarify? 2: In computing the Z score shouldnt we see how far is the current datapoint from mean rather than absolute value. so Z score should be (current value of residual – mean of last 200 onservations)/ standard deviation of 200 observations of residual. Please clarify? 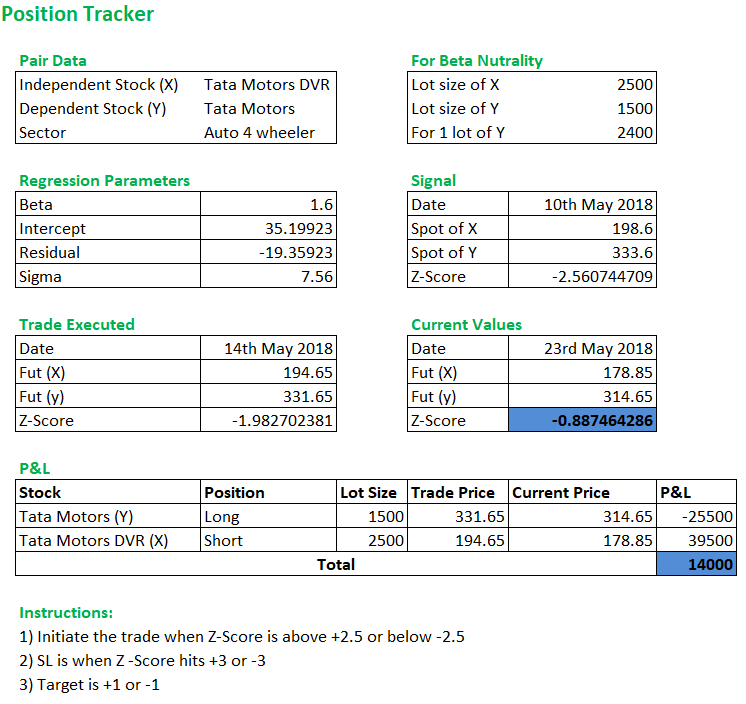 Given that X and Y are stock prices – shouldnt the beta neutrality be applied on nominal exposure so if tata motor (Y) – Tata Motor DVR (X) has a BETA of 1.59 shouldnt it mean that exposure on tata motor should be equal to 1.59 times the exposure on Tata Motor DVR? ——-> This is correct. so if nominal value of one lot of tata motor is (1500*331.65) Rs 497,475 the exposure i need to take in DVR is 1.59*497,475 = 790,985 which translates into 4064 shares of DVR @ 194.65. please clarify? ————-> Beta adjustment should happen on the stock price, not the contract value. Remember, price is already factored in when computing the Beta. In computing the Z score shouldnt we see how far is the current datapoint from mean rather than absolute value. so Z score should be (current value of residual – mean of last 200 onservations)/ standard deviation of 200 observations of residual. Please clarify? —————> This is how Z score is calcualted. Not sure if I’m missing the point here. 1. Initially it was told that data available (lock back period) shall be atleast 1 year, it is better if it is 2 years but at the end of module, it is told that 200 days data is best? which statement is correct then? 2. If I see today that two stocks are co-integrated and their residuals are stationary then does it mean that they will remain co-integrated (along with stationary residual) in future too? or we need to check co-integration and stationarity at frequent intervals? 1) 200 data points is roughly a year, Arun. So stick to at least a year. 2) Not necessary, the stationarity may break based on price movement (drastic price moves). Regarding Point No. 2, does it mean that I need to run adf test DAILY till I find p-value<0.05? Yes sir, its better that way. Some of the stocks don’t have Futures but only Spot. for ex. Andhra Bank, Bandhan Bank etc. hence they don’t have lot sizes. Do we need to avoid such stocks or there is a way of pair trading in them? Hmm, as long as you only need to go long on this and short the other stock’s future, it should be ok.
My apologies, I didn’t get it. can u plz elaborate, probably with example? Meaning, the X and Y ordering should be such that the non-derivatives stock always needs to be bought and the derivative on needs to be shorted, if this is taken care off then you can look at the combination of non-derivative stock + derivative stock. Sir, how do we do this on intraday basis? Should we use last 200 EOD prices and track z score at suitable intraday frequency to look for opportunities or should we use last 200 candles of corresponding intraday frequency? I’d suggest last 200 days EOD candles, Kushal. Hi Whats your take on USDINR & EURINR PAIR Trading. Have you analysed or tracked the pair. I’ve not really looked into this. Dear Nithin , I want your advice on technical course available online ,which as per your recommendation is best suited for professional who want to understand the technical analysis from beginning to advance level . Dharmendra, frankly whatever you need to know is already available online on Varsity. Why do you want to spend money? Hi when I downloaded that excel file I can just see the variables confined to that particular date and time. What can I do to run the excel file for any given date and time? That sheet is just to demo the trade, Kaushik. It does not run on its own. Can u tell me how u calculated adf value and error ratio for all pairs of stock in excel? Kaushik, its explained in the chapter itself. I recently read this thesis paper by Hakon Andersen & Hakon Tronvoll in which they did pair trading using PCA(Principal component analysis) and Density Based Clustering. Which one is better? Linear regression method or PCA method. Can u add and explain this PCA method in zerodha varsity website? I’ve never used PCA method, Kaushik. Rather, I’m not sure about the technique to do so. But if I were to guess, PCA would be nice, since PCA emphasis is only on factors which explain the maximum variance, ignoring the other factors. At the end of the chapter you talked about trading using multi variate regression. Could you please point to a source where I can read this? Unfortunately, I’m unable to find a good/reliable source for this, Prafulla. Do we not have to run Correlations between all the stocks of a sector, say all stocks in nifty bank, BEFORE doing the regression analysis? We did that in the first case. Should we not run regression on only those stocks that are statistically significantly correlated >.75? Should we run regression on all stocks without looking at their correlation? Is the stationarity of the residuals a necessary and sufficient condition of a statistically significant correlation? 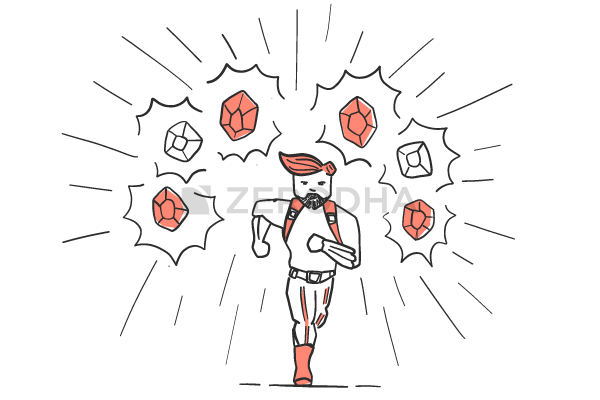 Would running correlations apriori not reduce the number of regressions needed to be run? Would running correlations apriori exclude some trading opportunities that would otherwise have been spotted by NOT doing a correlation analysis and only looking at the regression and cointegration of the pair? I’d suggest you to not look at correlations if you are using this approach to pair trade. You can, this really depends on the program that you have developed. Hello sir, small correction in log of 18th may, 3.30 PM values of X and Y are entered opposite. I was going through and it showed me profit of 518350. For a second i had a big smile,haha! Ah, need to check this, Kiran. Thanks for pointing this out. Sir pair data sheet which is available to download is it updated or we have to download 200 day values, regress it and do it ourselves? Thank you. Its not updated, Kiran. We stopped doing it long ago. Okay. Will you suggest any vendors or sites where we can subscribe and get latest pair data updates? Thank You. I’m not too sure of vendors who provide this data, Kiran. Delta of residuals and t-1 residual. Is this the right way? — I dont think so, Narendra, but I cant point a finger and say why. Will get back on this. please see the weblink. I used this method to find ADF. For your ref.